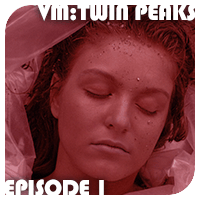 The small town of Twin Peaks, Washington, is shaken up when the body of high school student Laura Palmer is discovered near a riverbank, wrapped in plastic. FBI Agent Dale Cooper sees a connection between Laura’s death and the murder of another girl one year earlier; Cooper suspects that same killer might have struck again. I enjoyed the show, fellas. Didn’t expect you guys to like it as much as you did, so that was a nice surprise. I know the music might sound a little dated at times, but it’s one of my favorite elements of the show and hopefully as the series progresses it’ll grow on you guys as well. Wanted to let you know that you are indeed familiar with some of Mark Frost’s other work. He co-wrote both Fox Fantastic Four films as well as episodes of Hill Street Blues and The Equalizer! Then I wish Frost would have gotten David Lynch on board for the Fantastic Four movies. It couldn’t have hurt. I’d love to see David Lynch direct a Sandman Mystery Theatre film.